Thank Goodness. Hopefully we see better quality and more toys in general. During my hunt for JW merch I was pretty bummed that the best stuff was pretty much regulated to Lego and Die Cast Cars. I feel like this news is double edged. On one hand, Hasbro really dropped the ball with Jurassic World making some damned lackluster products - and that's putting it kindly. While Mattel generally puts more effort into their products, I find them less appealing to Hasbro's overall. Between the scales and styles they favor, I just am apprehensive to believe longtime Jurassic toy fans will get what they want. Hasbro shows they can do amazing things (look at everything Star Wars - or Jurassic Park 2009/2013). I just am not willing to believe that them losing the line after so long is a great thing. Fingers crossed Mattel not only looks to do good with license, but also looks into the past of the Jurassic Park toys, and makes items that feel like a continuation. Hasbro really, really, really messed this up though. (08-02-2016, 05:08 PM)jobalexang Wrote: Hasbro really, really, really messed this up though. Yep - and now the right thing has happened. They lost the license. I love it. I hope I'm wrong but by looking at Mattel stuff that has been in stores recently I'm just expecting more of the same trash if not worse. (08-04-2016, 08:34 PM)Raptor Blue Wrote: I hope I'm wrong but by looking at Mattel stuff that has been in stores recently I'm just expecting more of the same trash if not worse. Unfortunately, this is how I feel as well. Mattel will really have to change their business model and toy style to make a good Jurassic lineup. Their $20 6" Ghostbusters figures are nice, but they're $20 and 6". Beyond that..
Hasbro and Mattel have become increasingly more cheap towards the production of their licensed toys... This does not bode well for JP/JW in my opinion. Kind of like the black shoe or the brown shoe. All that's different is the color (i.e. licensee Mattel). Mattel might do the same, which would be terrible. I hope they do great but not putting my faith in them yet. 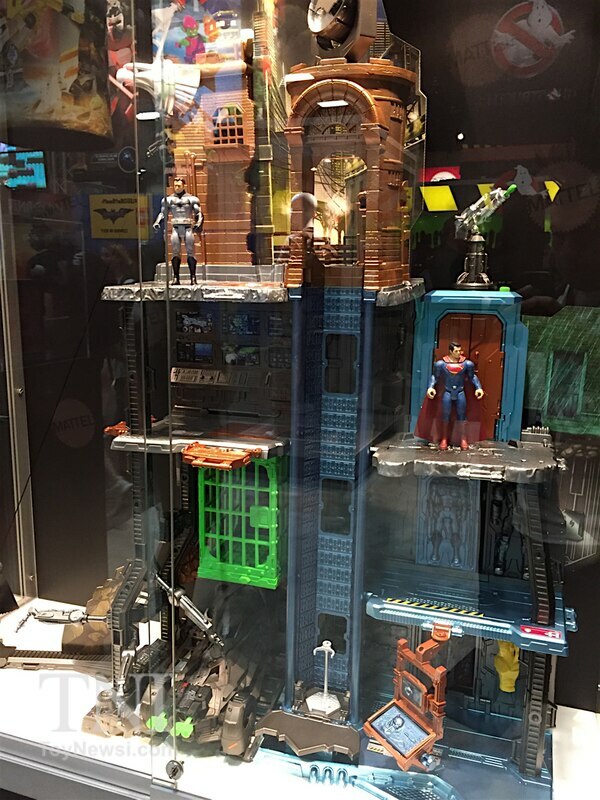 Just wanted to share some information on a 6" scale playset (yes, 6" scale playset) Mattel is coming out with for their DCEU line. The top part is a city hall type structure with the Bat Signal on top, and the subterranean level is the Batcave. I saw the playset at Comic Con, and it's at least 3' tall. It's loaded with play features such as an elevator, jail cell, parking for the Batmobile, an armory, the Bat Computer, and some weapons. It's a Walmart exclusive, and retail is expected to be about $100. It's quite incredible how in a world of toy companies that are increasingly hesitant to make playsets, Mattel has opted for a 6" scale version and seemingly gone all-out in developing it. Hasbro certainly isn't doing them anymore. This gives me hope as to what kind of potential Mattel has the Jurassic line. I just really hope Mattel keeps the toys in scale with each other, at least somewhat. Like the original JP and LW lines, for example. You had your human figures, then you had the big dinosaurs like t-rex which were accurately sized compared to the humans, then you had medium dinos like the young rex and stegosaurus, and small dinosaurs like the raptors that were comparable to humans. By contrast, the toys for JP3 and JW didn't have any rhyme or reason to their sizing. Raptors and t-rexes are the same height. Sure, they larger versions of Rex and Indominus, but then that just made it weird having the same figure in multiple sizes instead of having any kind of logic or thought put into the size of the toys. I keep thinking about Dino-Riders when I think about this topic, probably because that was a dinosaur line that Mattel handled, and because they did it well. Different sized dinosaurs in an accurate scale, and a variety of different unique species. Sure that was 30 years ago and the industry has changed, but I hope they keep something like that as well as the classic JP figures in mind as their goal.